Gasoline Automobiles by William Baxter Jr.
with such rapidity as virtually to become an explosion. The force of this explosion pushes the piston to the further end of the cylinder, and by means of a connecting rod and a crank this movement imparts a rotary motion to a shaft. The entire operation is made perfectly clear by the aid of Fig. 1, which is a simple diagram of a single cylinder motor. The chamber R contains the gasoline. Air enters this chamber through tube b, as indicated by the arrow, and passes out between the plate c and the surface of the gasoline. The float d keeps the plate c in the proper position regardless of the amount of liquid in the reservoir. The heated gases exhausted from the cylinder pass through the pipe r, and thus heat the gasoline so that it vaporizes freely and the air passing under c becomes charged with the necessary proportion of vapor. The mixed air and vapor enter a valve chamber S, from which the flow into pipe e is regulated by the movement of handle a. In this chamber there is another valve, operated by an independent handle, and by means of this more air can be admitted into the mixture when desired. Through the pipe e and the valve f the vapor enters chamber Q, which connects with the top of the cylinder. Suppose the shaft G is rotating, then the piston will be drawn down from the position in which it is shown and thus a vacuum will tend to form in chamber Q. This action will cause the valve f to open and the mixture of air and vapor will flow into Q until the piston reaches its lowest position and begins to ascend. At this instant the valve f will close, and then the upward movement of the piston will compress the mixture in the chamber Q. When the piston reaches the upper position, after completing the down and up strokes, the lever l and the contact point p will come together, and an electric current developed in the induction coil M will pass through the wires j and k and produce a spark at i between the ends of the metallic terminals passing through the plug of insulating material, which is shown in dark shading. This spark will cause the mixed air and vapor to ignite, producing an explosion that will force the piston down for the second time. On the second upward movement of the piston the gases produced by the combustion of the vapor will be forced out through the valve h into the chamber T and the pipe r. The valve h and the lever l are operated by cams mounted on the shaft m, and they are so set that the spark at i occurs when the chamber Q is full of the explosive mixture and the piston is at the top of the cylinder. The valve opens when the piston begins to move upward after the explosion has forced it to the bottom position. As will be seen, the piston must move down to draw in a supply of the explosive mixture; it then moves upward to compress it, and on the second down stroke it is pushed by the force of the explosion. From this action it can be clearly realized that the power developed by the motor comes from the force exerted by explosions at every alternate revolution of the shaft. On that account the cams that move the valve h and the lever l are placed on a separate shaft, which is geared to the main shaft in the ratio of two to one; that is, the wheel K is twice the diameter of the wheel J. As the force of the piston acts on the shaft only once in every two revolutions it is necessary to provide a heavy fly wheel O, which will store up enough momentum to continue the rotation of the motor through the ineffective revolution. Before the motor can put forth an effort it is necessary for the piston to move downward so as to draw in a supply of explosive gases and then to move up so as to compress them and produce an explosion; therefore, the motor will not start of its own accord, but must be set in motion. In the act of starting the wheel O is turned by hand. Fig. 2. Petroleum spirit Motor. ribs so as to increase the surface exposed to the air and thus increase the radiation. The electric spark is a very effective igniter for the explosive mixture, and, by properly setting cam n the explosion can be made to take place just at the position of the piston that may be found the most desirable; but the points at i are liable to get out of order, and the battery that actuates the induction coil M and the coil itself can become a source of more or less trouble, and on that account the igniting is effected in some motors by means of a hot tube. When this is used the cam n, the lever I and the electrical parts of the apparatus are not required. In their stead a tube is placed on the upper side of the chamber Q and this tube is maintained at a red heat by means of a flame impinging against its outer surface. When the explosive mixture is compressed it rises in the interior of the hot tube, and when it reaches the portion that is hot enough to produce combustion an explosion takes place. By many engineers this arrangement is regarded as superior to the electric spark on account of its simplicity. the valve s is the counterpart of f, while s’ corresponds to the valve h. The upper pipe t is the pipe e of Fig. 1 and the lower pipe t' is the pipe r of the same figure. Although the crank discs, connecting rods and other details are different in shape, it will readily be seen that their relation to each other is the same. Fig. 4. Plan and Elevation of Underberg, Motor Voiturette. will be opposite to its motion when driven through F and H, therefore, if when F drives the carriage runs forward, when G drives it will run backward, and when E is moved to the central position, so that neither s nor ss engages with their respective gears, the vehicle will stand still, but the motor will continue to revolve. This diagrammatic arrangement is more simple than the gearing actually used and is not as complete in action as many of the devices, as it only provides means whereby the direction of rotation of the axle may be changed, while in many carriages the gearing also varies the ratio between the speed of the motor and the driving wheels. It is also quite common to combine in the train of gearing spur gears and sprocket wheels, and in some instances even belts. Fig. 4 illustrates a French gasoline automobile made by Underberg, of Nantes. The first figure is a side view, and the second is a plan of the truck and driving mechanism. The motor, which is of the single cylinder type, cooled by radiation into the air, is located at N. The pinion on the end of the motor shaft engages with the wheel on the end of shaft A. This shaft carries four gears, which can be moved by means of lever C, so as to engage with corresponding gears on shaft B, thus providing four different speeds. The motion of B is transmitted to the rear axle by means of a belt that runs over the pulleys p and P, the latter being carried by a differential gear, so as to run the two driving wheels at proper velocities. Fig. 5. Cherrier Two-speed Gear. The circular ribs surrounding the motor cylinder are well shown in the figure, in which the carburator of C is also seen. The housing for the motor is open at the sides so as to give air currents free access. In Fig. 4 the speed changing gears are shown, the reversing train being omitted; but if it were also drawn in, the diagram would be far more elaborate than Fig 3. Another form of variable speed gear is shown in Fig. 5. This provides for two speeds. The large wheel E is on the carriage axle, and it is driven either by a pinion F, or by J. Upon the shaft O there are two friction clutches C D, and when C acts the pinion F drives E, and when D acts the pinion G drives H, which in turn drives I, and this wheel is mounted on the same shaft as J. Some of the best-known makers of gasoline vehicles do not employ variable gears and depend for changes in the speed wholly upon variation in the velocity of the motor. The De Dion carriages are made in this way, the gearing being substantially as illustrated in Fig. 3. Fig. 6. Panhard & Levassor Vehicle. Fig. 7. Motor of Vehicle. be readily seen, is of the two-cylinder type, cooled by a water jacket, just as in Fig. 1. The explosion is produced by means of a hot tube, as explained in connection with the last-named figure. This motor is placed under the body of the vehicle, and is connected with the rear axle by means of a train of gearing which terminates in sprocket wheels and chains that connect with driving wheels, each one being operated by a separate chain. In Fig. 6 the sprocket wheel and chain are well defined, and forward of these can be seen the outline of the casing enclosing the gearing. Fig. 8. General View of Renault Voiturette. Fig. 9. Plan of the Truck. Fig. 10. Variable Speed Gear. bevel gear on the axle is of the differential type, so as to drive the wheels R R at the proper velocities. When a high speed is desired, the variable speed gear, Fig. 10, is set so that shaft M drives N direct, the clutch at E being moved so as to interlock. N is the end of shaft H, so that with this connection the bevel pinion, which meshes into the axle gear at D, revolves at the same velocity as the motor shaft. By moving the handle V, Fig. 9, to the right, an intermediate speed is obtained, and by moving it to the left, the carriage is run at the lowest velocity. When the handle V is turned to the right, the ends M and N, which form the clutch E, Fig. 10, are separated, and at the same time the lower shaft H is moved toward M, so as to cause gear 1 to mesh into gear 2, and also 3 into 7. By this means the end N of the axle-driving shaft is rotated through the train of gears 1, 2, 3 and 7. If the handle V is turned to the left, the shaft I is moved toward M, so as to cause gear 1 to mesh into gear 4, and gear 6 into 8, the latter being secured to end N of the axle-driving shaft. The speeds obtained by these changes are in the ratio of nearly 1, 2 and 4. Fig. 11. Plan of the Turgan-Foy Voiturette. axle, and arranged to impart motion to the hind axle by means of belts. The motor, which is located at A, turns a vertical shaft, and this, through spur gears, rotates a horizontal fly wheel, B. Two pulleys are mounted upon the motor shaft, and from these belts run to tight and loose pulleys on a countershaft, S. From the latter the rear axle is driven through two sets of spur gearing, which give two different speeds. By means of the belts, two other speeds are obtained, thus giving, in all, four different velocities. To stop and start, the belts are shifted from the tight to the loose pulleys by a belt-shifter, f. At h, a muffling chamber is located, into which the motor exhausts, so as to reduce the noise. The elevation and plan of one of the celebrated French racing machines, the Vallée car, is shown in Fig. 12. 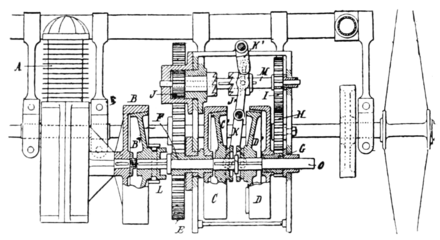 The motor of this machine is of sixteen horse-power capacity, has four cylinders, and is connected so as to impart motion to the hind axle by means of a single wide belt, which is marked G in both the line drawings. The driving pulley on the motor shaft is located at H, and the axle pulley at H'. Within the latter there is a train of gears for reversing the direction of rotation of the axle, and also for obtaining the differential velocities of the two driving wheels. There is no mechanism for variable speed, this being obtained wholly by changes in the velocity of the motor. The motor speed can be made to vary through a wide range by using four cylinders, with which it is possible to reduce the velocity so low that it would be likely to bring the machine to a standstill if provided with one, or even two, cylinders. The change in the motor velocity is obtained in part by the action of a governor located in a chamber at A, and in part by the action of the electric ignition device which is arranged so that the time when the spark is produced can be varied. The rear axle is so held that it can be moved through a short distance, horizontally, by manipulating the lever D, and in this way the belt G can be made tight or loose, thus affording another means for varying the speed. A brake is provided which presses against the inner side of the axle pulley, H.
Fig. 12. Elevation and Plan of Vallée Car. This brake is used ordinarily, but in the case of an emergency another brake can be operated which presses against the outside of the wheel in the space between the two sides of the belt. It is claimed for this vehicle that by the elimination of mechanical speed-changing devices, a great deal of weight is saved, and that this is more than enough to compensate for the extra weight of the motor, arising from the use of four cylinders. In most gasoline carriages it is necessary to provide a slow-speed gear for hill-climbing, as the motor cannot put forth a sufficient effort to ascend a steep grade at the normal velocity. With this racing-machine such a gear is not required owing to, the enormous power of the motor. showing, which might have been considerably improved if it had not been for an accident which compelled it to retire from the contest. The vehicle shown in Fig. 14 is of small size and light construction, although amply strong for the purpose for which it is intended. The power of the motor, which is located under the seat, is transmitted through friction wheels. In looking at the illustration it will be noticed that the hind wheels have a circular rim attached to the inner side, and of a diameter somewhat smaller than the wheel itself. Two small friction wheels are placed so that either one may be pressed against the inner surface of this rim. The 'shape of the rim, as well as that of the small wheels, is such that they hug each other firmly, so that the rim is carried around in a direction which corresponds with the direction of rotation of the friction wheel. In operating the carriage the motor is set in motion, and then one or the other of the two friction wheels is pressed against the rim on the driving wheel, according to whether it is desired to run forward or backward. While this arrangement might not operate with entire success if applied to a heavy vehicle, it appears to be all that could be desired for a light carriage. Three-wheel vehicles have been used, but there is a difference of opinion as to their value, as the construction has disadvantages as well as advantages. It is evident that such a vehicle can be steered with greater ease than one running on four wheels, but on country roads, where the wagon wheels roll down a smooth surface, and leave the space between in a rough condition, it is equally evident that the third wheel, in passing over this uneven surface, would jolt the vehicle to a considerable extent. On a smooth pavement the three-wheel vehicle will run fully as well as the four-wheel; but, on the other hand, on such a pavement the latter can be steered with as little effort as the former, so that the question of superiority of design is one that probably depends upon individual taste. From the descriptions of automobiles given in this and the two preceding articles, it will be seen that although many of them are used, especially in France, they are not entirely free from objectionable features. The electrical vehicles are provided with the most simple and durable machinery, and, being noiseless, odorless and free from smoke, are all that could be desired in so far as their operation is concerned; but they are heavy and can only be used in places where the batteries can be recharged. The steam vehicles are light, have simple mechanism and can run anywhere; but they exhaust steam into the air, which is clearly visible in cold or wet weather, and the heat from the engine and boiler is an objection, at least in summer time. The gasoline vehicles run well, but are noisy, and the odor of the gasoline is disagreeable as well.